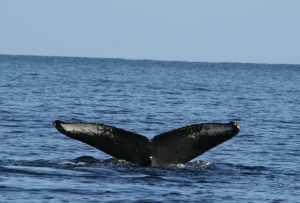 We had some interesting sightings during Monday’s Wake up with the Whales Cruise. The surf was up, and that often means we have to head way out to sea to find whales, but it wasn’t the case on Monday. We actually saw a spout just north of the bay, and it turned out to be from a lone whale. This guy was really light colored…and kind of small (maybe a yearling). He was acting a bit erratic, spouting frequently, and never spending a long time underwater. We watched him do a pec slap, an attempted tail lob, an actual tail lob and a breach before we headed out to see a couple of other Humpbacks. This second pair consisted of a logging whale (see today’s Fact of the Day for more info on that), and his partner. The partner was surfacing, spouting and diving every 15 minutes or so, but always came up near his logging pal, and when he sounded we got to see his beautiful flukes . Since the logging whale was drifting so close to us, we couldn’t engage our engines…but we took the opportunity to lower the hydrophone. We got to hear some very clear and loud singing (but no snoring). Guests on our Mid-Morning Whale Watch Cruise saw 9 different Humpbacks multiple times including a breacher off in the distance. When we deployed our hydrophone, the sounds we heard were extremely loud. When the singing stopped, we knew to look around, and sure enough, those two singers surfaced very close by. Ocean Sports Whale Fact of the Day: What is “logging”? When Humpback Whales sleep, they float just on or under the surface of the water for extended periods of time, not moving (much), breathing every couple of minutes, and resembling floating logs (thus, the term). Interestingly, whales don’t sleep as soundly as we do — if they did, researchers believe that they’d drown. Humans breathe in response to carbon dioxide build-up in our blood, but Humpbacks and cetaceans have to keep part of their brain awake at all times so they remember to breathe — researchers call this “uni-hemispheric slow wave sleep”. Mallard ducks and some species of seals sleep this way too. The active half of the brain presumably is monitoring breathing and perhaps scanning the surroundings for predators, while the passive half is resting.